The Myanmar Companies Law – which will replace the outdated Myanmar Companies Act (1914) (MCA) – has been drafted with a view to encouraging foreign direct investment in Myanmar as well as foreign participation on the Yangon Stock Exchange (YSX). The introduction of the Myanmar Companies Law is part of a broader legislative initiative to bring Myanmar’s company law into line with international standards. The Myanmar Companies Law will complement the revised Myanmar Foreign Investment Law (2017 FIL) which is also expected to be introduced by the end of March 2017. 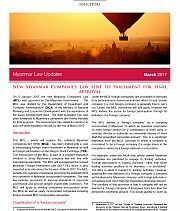 The Myanmar Companies Law updates the regulatory framework governing the establishment and operation of Myanmar incorporated companies. The new law includes provisions to improve standards of corporate governance and provide greater shareholder protection. The Myanmar Companies Law will apply to existing companies incorporated under the Myanmar Companies Act as well as newly incorporated companies including foreign invested Myanmar Companies Law incorporated Companies. 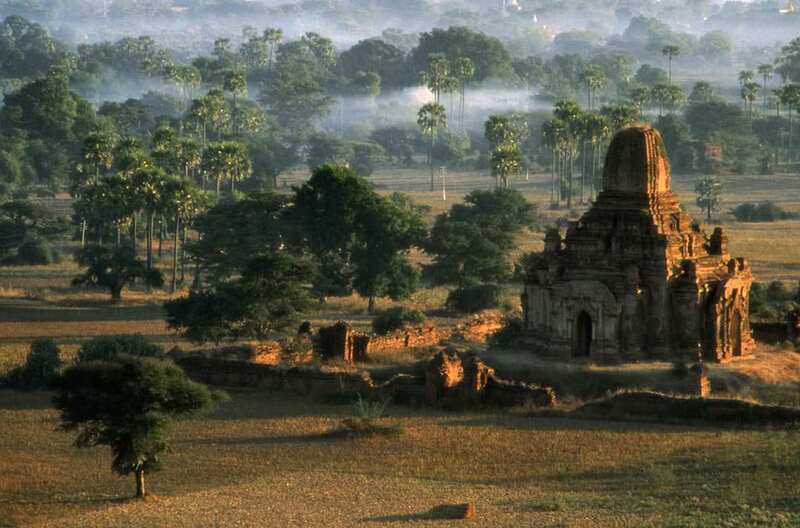 Under the Myanmar Companies Act ‘foreign companies’ are prohibited or restricted from participation in numerous activities which a local ‘private company’ (i.e. non-foreign company) is generally free to carry out. Under the Myanmar Companies Law restrictions will still apply, however the Myanmar Companies Law widens the scope for foreign participation through its definition of a ‘foreign company’. The Myanmar Companies Law defines a “foreign company” as a company incorporated in Myanmar “in which an overseas corporation or other foreign person [or a combination of both] owns or controls, directly or indirectly, an ownership interest of more than the prescribed ownership amount”. This is a significant departure from the Myanmar Companies Act, pursuant to which a company is considered to be a foreign company if a single share in the company is owned by a foreign national or corporation. For example, under the Myanmar Companies Act only wholly owned Myanmar companies are permitted to engage in ‘trading’ activities. Foreign participation in ‘trading’ activities – other than those trading activities ancillary to its business – is prohibited2. The Myanmar Companies Law is silent in respect to ‘trading’ activities. However, applying the new definition of a ‘foreign company’ a company will not be deemed a ‘foreign company’ until foreign nationals or companies hold ‘more than the prescribed ownership amount’. The corollary of this provision is that a company will be deemed a ‘Myanmar company’ if foreigners hold less than the prescribed ownership amount. This would appear to open up participation in ‘trading’ activities to foreign investment, as long as the level of foreign ownership is less than the prescribed ownership amount. The Myanmar Companies Law is silent as to ‘the prescribed ownership amount’. It is expected that the ‘ownership interest’ or ‘ ownership amount’ will be fixed at 35%3 , although the Government is likely to reserve the right to waive or vary permitted levels of foreign ownership to encourage foreign investment in certain sectors or to protect local companies. Moreover, the Government will want to retain the power to vary permitted levels of foreign ownership as the Myanmar economy develops. Under the Myanmar Companies Law a single constitutional document (Constitution) replaces a company’s memorandum of association and articles of association. Under the Myanmar Companies Act companies are required to state their objectives in the company’s memorandum and articles of association. 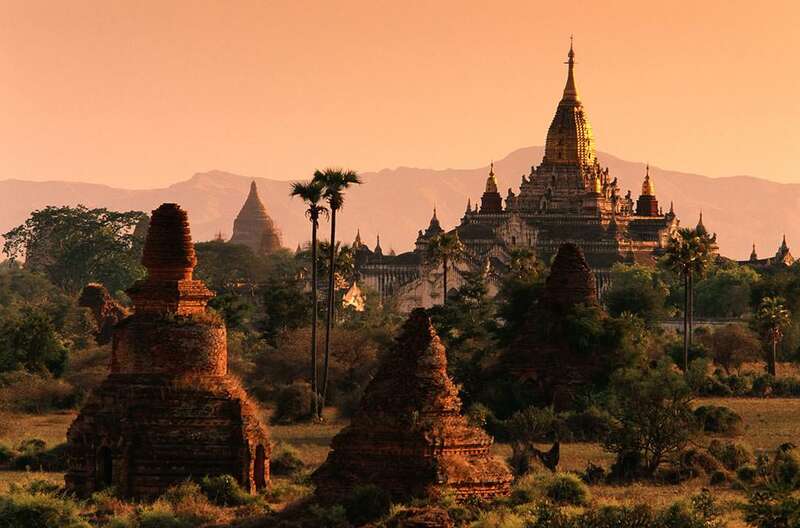 The Myanmar Companies Law removes the requirement for an ‘objects clause’. The Constitution gives a company “legal capacity to carry on any business or activity”4 (assuming participation in such activities is generally permitted by law and that the company is in receipt of all the requisite permits and licences to engage in such activities). A company can file its Constitution in either the Myanmar or English language. The memorandum of association and articles of association of an existing company shall take effect as the Constitution of that company following the commencement of the Myanmar Companies Law. The ‘objects clauses’ of companies established under the Myanmar Companies Act will lapse 12 months from the passing of the Myanmar Companies Law. These companies will then automatically be deemed to have the capacity and powers granted to newly companies incorporated under the Myanmar Companies Law. The removal of the ‘objects clause’ broadens a company’s powers on incorporation. Companies established under the Myanmar Companies Act should therefore consider the early removal of their ‘objects clauses’ to benefit from the broadened powers available to the company. Alternatively, certain companies may prefer to retain their original objects clause, especially if the clause was drafted as a shareholder protection measure. Companies whose original objects were either prescribed by, or approved by a Government Department or Ministry should consider whether the further approval of that Department or Ministry is required before it amends its objects. A company may amend its objects through a special resolution of its shareholders. Under the Myanmar Companies Act, companies are also required to state their objectives in the company’s Form 1 (Permit to Trade) issued by the DICA as well as in the memorandum and articles of association. The Myanmar Companies Law removes the requirement to obtain a Permit to Trade. A company registered under the Myanmar Companies Law will be granted a Certificate of Incorporation. The Certificate of Incorporation shall be a conclusive evidence that all the requirements of the Myanmar Companies Law in respect of registration have been complied. No Permit to Trade will be issued. When registering a transfer of its shares with DICA, a company is required to state whether or not the share transfer being registered causes the company to become, or alternatively cease to be, classified as a ‘foreign company’ under the Myanmar Companies Law. Pursuant to the MCL, a Myanmar private company must have at least one resident director.5 The Myanmar Companies Act required private companies to have at least two directors. Public companies are now required to have three directors, a reduction from seven required under the Myanmar Companies Act. There is no requirement for a company to appoint a Myanmar national as a director. However, at least one director must be ordinarily resident in Myanmar, i.e. a resident in Myanmar for at least 183 days in each year. The Myanmar Companies Act does not contain detailed provisions on directors’ duties or the remedies available to members, other directors, and the company for breach of directors’ duties. The Myanmar Companies Law introduces internationally recognisable rules and standards in respect to the exercise of power by company directors in Myanmar. Directors have a general duty to act in good faith, in the company’s best interest6 and for a proper purpose. The Myanmar Companies Law sets out more specific requirements with regard to a director’s use of position, use of information, and disclosure of interests , and make a director duty bound to act lawfully and in accordance with the company’s Constitution. To discharge their duty to act in the company’s best interest and for a proper purpose, directors should consider the likely long-term consequences of decisions. Directors are specifically required to consider the effect their decisions will have on the company’s employees, its business relationships with customers and suppliers, the environment and the company’s reputation7.
. Existing foreign invested companies may wish to consider amending their share structure to establish a 100% Myanmar subsidiary. 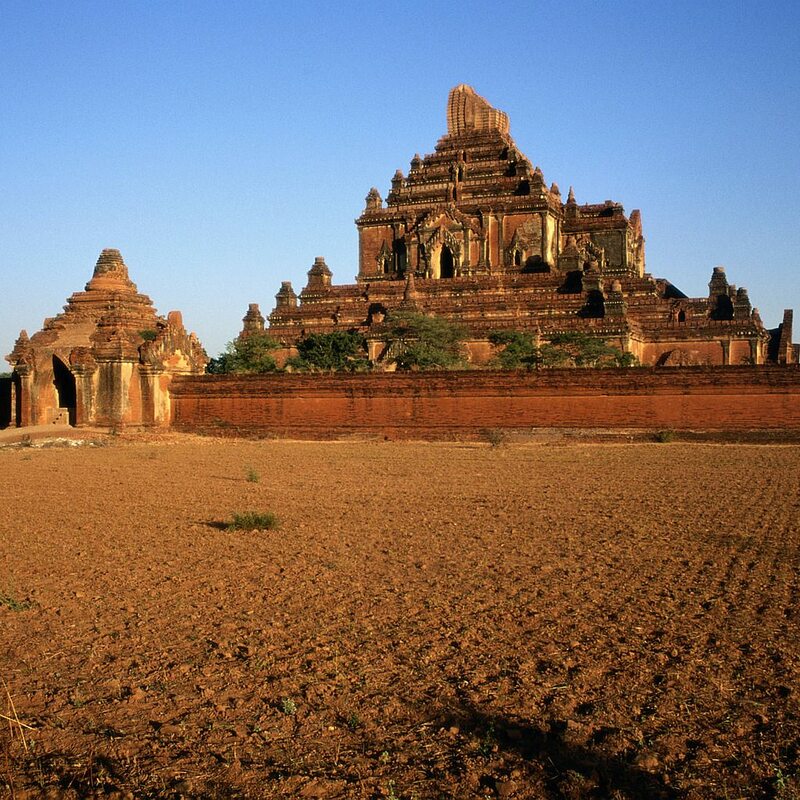 The Myanmar Companies Act contains limited protections for minority shareholders. The Myanmar Companies Law introduces numerous new provisions safeguarding the rights of minority shareholders in Myanmar companies. Division 19 of the Myanmar Companies Law -‘Members’ rights and remedies’ – sets out detailed provisions in respect to the oppression of shareholders. Under Section 192 ‘oppression’ is broadly defined to include acts contrary to the interests of the members as a whole or oppressive to, or unfairly prejudicial to, or unfairly discriminatory against, a member or members whether in that capacity or in any other capacity. The list of persons who can take an action for ‘oppression’ is set out in Section 194 and includes members, former members (if the application relates to the circumstances in which they ceased to be a member), or any person DICA deems to be an appropriate person. 10 to have the affairs of the company investigated. DICA will investigate the company if it is of the opinion that the company or one of its directors or officers may have committed an offence and the application by the appellant shareholder was made in good faith and on reasonable grounds. Section 126 sets out provisions and procedures in respect to the variation of rights of holders of classes of shares. Pursuant to Section 126(e) a shareholder who has had the rights attached to their shares varied can appeal against the varying of such rights, provided that they voted against the resolution tabled in respect to the variation. Companies can also provide for additional minority shareholder rights in their Constitutions. 11. Under the Myanmar Companies Act the share capital of a Myanmar company can be divided into different classes of shares but a foreign investor cannot hold preference shares that are convertible into ordinary shares. The use of different classes is expected to assist financing efforts and the structuring of the rights of different shareholders. The Myanmar Companies Law introduces new rules on capital maintenance and alteration. Section 115 sets out detailed requirements on the reduction of share capital whereas Section 120 sets out provisions in respect to share buy-backs. Reductions of share capital and share buy-backs may be equal or selective. An agreement for an equal reduction of share capital or buy-back must be approved by an ordinary resolution passed at a general meeting of the company or must be made conditional to such approval. Agreements for a selective reduction of share capital or selective buy-back must be approved by a special resolution passed at a general meeting of the company, with no votes being cast in favour of the resolution by any person who is to receive consideration as part of the buy-back, or by their associates or alternatively by a resolution agreed to, at a general meeting, by all ordinary shareholders. A solvency test applies to reductions of share capital, share buy-backs and the redemption of redeemable preference shares12 . Division 22 of the Myanmar Companies Law sets out provisions in respect to mortgages, penalties and charges. Under the Myanmar Companies Law charges or mortgages on a company’s shares or property are void if not registered. The DICA will keep, with respect to each company, a register of all mortgages and charges created by the company after the commencement of the Myanmar Companies Law. Companies will be issued with a certificate of the registration of any mortgage or charge registered. Pursuant to Section 239 every company is required to keep a copy of every instrument creating any mortgage or charge requiring registration under Section 229 at its registered office. The copy of the instrument creating a mortgage or charge shall be kept at the company’s registered office and be available for inspection at all reasonable times by any creditor or member of the company. There is no fee for the inspection of these instruments by a creditor or member. The register of mortgages and charges maintained by DICA will also be open to t inspection by any other person on payment of such reasonable fee as the company may specify. The Myanmar Companies Law introduces simplified statutory requirements for small companies. A ‘small company’ is a company which is not a subsidiary of a public company, which has less than 30 employees and which together with subsidiaries has an annual revenue of less than Kyats 50 Million (or approximately US$37,000). Small companies may be exempted from requirements such as the appointment of auditors, the filing of financial reports13 and the holding of Annual General Meetings14. The DICA will determine whether or not a ‘foreign company’ qualifies as a small company. YSX Foreign participation in Myanmar companies will allow foreign investors to purchase shares on the YSX, which in turn is expected to aid the development of the YSX as a trading platform by opening it up to more institutional investors. Division 20 of the Myanmar Companies Law sets out provisions in respect to the filing of a prospectus by a public company and the contents of the prospectus. In this respect the Myanmar Companies Law reiterates many of the requirements contained in Sections 92 and 93 of the Myanmar Companies Act. The Myanmar Companies Law will, together with The Security and Exchange Law (2013), The Securities and Exchange Rules (2015), relevant Government notifications and the YSX business Regulations, provide the framework for the listing of securities on the YSX. It is important that the directors and officers of companies incorporated under the Myanmar Companies Act understand how the changes introduced by the Myanmar Companies Law affect them and their companies. Directors should become familiar with the various new directors’ duties contained in the Myanmar Companies Law. The directors and members of a company should consider whether or not to seek to amend the Constitution of the company to expressly permit a director act in a manner which he or she believes is in the best interests of that company’s holding company or in the best interests of a particular shareholder (or joint-venture partner) in the company even though it may not be in the best interests of the company itself. Companies which are already established under the MCA should generally consider whether or not to amend their Constitutions immediately after the enactment of the law (thereby broadening their corporate powers) or alternatively allow the 12 month transitional period lapse, after which they will then automatically be deemed to have the capacity and powers granted to newly companies incorporated under the Myanmar Companies Law. ‘Two-shareholder’ companies established under the Myanmar Companies Act should also consider whether or not they wish to become a ‘single-shareholder’ company, i.e. a wholly owned subsidiary. It should be noted that the Myanmar Companies Law does not substantially amend the financial reporting requirements for companies. Minor changes have been introduced to reflect changes in the Myanmar Accountancy Council Law. The procedures for winding up and liquidation of companies have not been substantially changed however a new insolvency law is expected to be introduced in the future. 1 It should be noted however that the Myanmar Companies Law’s progress to date has been slow. First drafts were circulated in 2015 and updated drafts in 2016. The new Myanmar Government’s legislative priorities are subject to change. 2 Instruction 2/2015 on the “Scope of Trading Activities Permitted for Investors in the Thilawa Special Economic Zone” introduced a limited exception to the general prohibition on foreign participation in ‘Trading Activities’. Instruction 2/2015 applies to investors in, and promoters of,the Thilawa SEZ only. 10 Or another Government body as may be nominated by the authority of the Ministry of Planning and Finance whose responsibilities include the administration of the Myanmar Companies Law.